Meanwhile, in 12-inch nonstick skillet, heat olive oil over medium-high heat. Add turkey, garlic and Italian seasoning; cook 5 to 6 minutes, stirring frequently, until turkey is no longer pink. Stir in 1 jar pasta sauce; heat to boiling. Reduce heat to low; cook 10 minutes, stirring occasionally. Transfer to medium bowl; cool 10 minutes. In medium bowl, mix spinach, carrot, ricotta cheese and eggs. Spread slightly less than 1/4 cup ricotta mixture evenly along center of each cooked lasagna noodle. Spread 1/4 cup turkey mixture over ricotta mixture, to within 1 inch of one short end. Roll up firmly toward unfilled end. Line 15x10x1-inch pan with foil. Place roll-ups seam side down in pan; cover loosely with foil. Freeze about 30 minutes or until firm. Place frozen rolls in two labeled 1-gallon airtight freezer bags. Freeze up to 3 months. 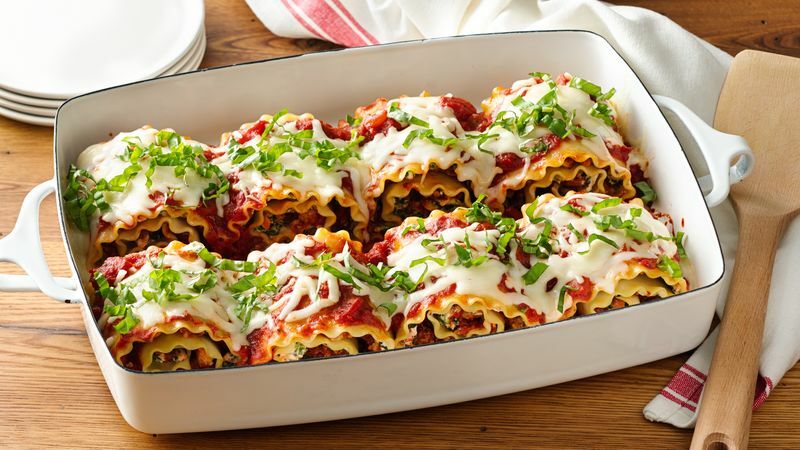 To bake 16 lasagna roll-ups, spray two 13x9-inch (3-quart) glass baking dishes with cooking spray. Remove roll-ups from freezer bag; place 8 in each baking dish. Cover with foil; thaw in refrigerator at least 8 hours but no longer than 24 hours. Heat oven to 350°F. Divide remaining jar of pasta sauce between baking dishes, pouring over and down sides of roll-ups. Cover tightly with foil; bake 40 to 50 minutes or until hot and bubbly. Remove foil; sprinkle each dish with 1 cup mozzarella cheese; bake 3 to 5 minutes longer or until cheese is melted. Let stand 5 minutes before serving. Top with basil. You don’t have to limit yourself to Italian herb pasta sauce. Try Muir Glen™ roasted garlic or tomato basil in this recipe instead. Try ground chicken or bulk Italian sausage in place of the turkey. Whole wheat lasagna noodles can be used in this recipe. Just work carefully when rolling as they tend to be a bit more fragile.